When I’m considering vintage cameras for purchase, I specifically look for cameras that still appear to work, and for which film can still be acquired somehow. Then, periodically, I grab a couple and test them out. This week, it’s the Agfa Silette Rapid F.
This is actually one of the first cameras I acquired; when I first developed an interest in vintage cameras, my older daughter bought it for my birthday at a local “junk” store in Windhoek, Namibia. Probably almost two years ago. And I’ve tried to run film through it a few times, but failed every time. Why? The Silette is one in a series of cameras produced from 1953 onward. The Silette Rapid F, introduced in 1964, was a response to Kodak’s new innovation, the self-contained film cartridge being used in its wildly successful “instamatic” series. Sadly – for Agfa – the system did not manage to make much of an inroads against Kodak. How did it work? 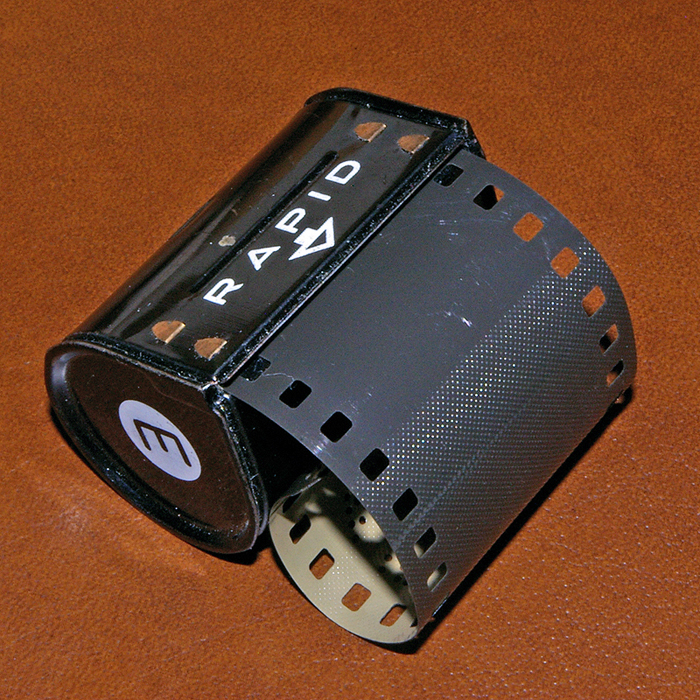 The film was sold in one of the “rapid” cartridges above. Another, empty cartridge would be used to take up the film, with a space between the two where the camera took the exposure. The camera used the sprockets to push the film into the take-up cartridge, and then it was just a matter of moving the (now) empty cartridge to the right to take up cartridge. So this was the innovation – not much over today’s 35mm cartridges, but a handier way to deal with film in the 60s. Of course, these have not been available pre-loaded in decades. So the solution is to pull about 40 inches of film (about an arm’s length) out of a regular spool, and just feed it into one cartridge until it becomes difficult. Where I was having trouble was in finding a completely dark room – I kept coming back with ruined film. To be honest, I didn’t know much how to set the speed and aperture for decent photos either. Because this camera is completely manual – you set the aperture (between f/2.8 and f/22), speed (bulb, flash, 1/30s to 1/250s), and then you estimate how far the subject is and set the focus distance. It did have a built-in flash with a pretty hefty battery, but I didn’t test that. One word of caution with these cartridges. If you develop your own film and are doing a few rolls, make sure this one is not left in your work area! I typically remove film from normal 35mm cartridges by ripping open the slot where the film comes out. I was tugging and tugging, having trouble getting a roll of film out of the cartridge, and when I finally managed, found no film inside. That’s when I realized I had ripped apart one of my Rapid cartridges, which in a dark room doesn’t feel much different from a normal film roll! This entry was posted in Life in India, Tips and Tricks, Vintage cameras and tagged Agfa, camera, film, Photography, Rapid, Silette, test, vintage. Bookmark the permalink. What, and I thought I was the only one who photographed a bicycle leaning against an old wall in India! Nah, I’m building a collection! A bicycle leaning against a wall is always a good picture!